EDGES™ with Mal Fletcher is a colourful, fast-paced programme that takes a very different look at the social issues shaping the values of today's world and the lifestyles of tomorrow. Using its magazine style format, each half-hour programme explains Christian worldview responses on some of the most pressing problems of our time. Issues covered in the most recent programs include Human Trafficking, HIV/AIDS, Global Poverty and more. The content of each programme is substantial, featuring interviews, on the street vox pops, videograpy and Mal Fetcher's presentations to camera. The programme's content and style is primarily aimed at a Gen-X young adult audience aged 25-40 years, but the program attracts many other viewers who are interested in the topics covered. Seven series of EDGES have been produced to date, with between ten and thirteen programmes in most series. The seventh series was released in 2009. Since its beginnings in 1996, EDGES has been broadcast via satellite, cable and terrestrial TV, and has been available in more than 100 nations. Programmes are also accessible online via the dedicated EDGES website at www.edges.tv and other broadcaster-linked web VOD portals. 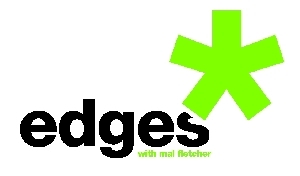 If you are a broadcaster wanting to know more about EDGES with Mal Fletcher, please contact us at . Catalyst w/ Mal Fletcher features interviews with respected activists and campaigners who are proven agents for change on a range of important issues including HIV/AIDS, poverty and justice issues and more. Each guest is specially selected for the insight they bring from years of future-engaging leadership. The host, Mal Fletcher, is a respected social commentator, futurist and author and has for 15 years produced and presented the 'Edges' TV series, which is seen in many parts of the world. For more, visit www.edges.tv/catalyst. TimeOut with Mal Fletcher is a series of 30 second television segments that look at everyday life from a hope-filled perspective. They cover a range of life issues, such as family, emotions, mentoring, sexuality and integrity. The TimeOut clips were originally produced following the success of Mal's Radio Spots. The material they contain is both challenging and thought provoking, and production is of the highest standard. If you are a broadcaster wanting to know more about TimeOut with Mal Fletcher, please contact us at . Projects currently in development include new documentary series and shorter features. To keep up to date with the unfolding developments in our media work, sign up for the periodical EDGES Update email newsletter. Please note, we will not give your email address to any third party for any purpose.